If you're looking for a mild lift to level out the front of your truck and also give a small lift to the rear, you've come to the right place! 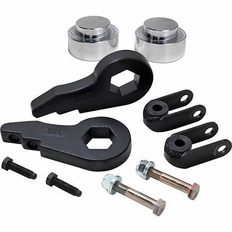 Ready Lift leveling and lift kits are an easy solution that are reliable, safe to use, and best of all, maintain factory ride quality, quaranteed. The part number for this Ready Lift front lift kit is 66-3090 and it fits 2000-2006 Chevy Avalanche, Tahoe, Suburban 1500 (all) models. It lifts the front of your truck up to 2.5" (the amount of lift is adjustable),and lifts the rear 1" giving your truck a level stance and allowing you to safely run up to a 33" wheel .